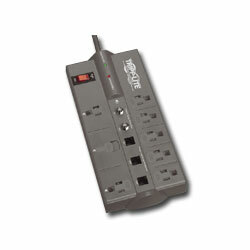 8 AC Outlet Surge, Spike, and Line Noise Suppressor with Coax/Modem/Fax Protection and Transformer Outlets with 8'Power Cord and Built-in RJ11 jacks to prevent surges from damaging your modem/fax/phone equipment. Built-in Type F coax jacks prevent surges from damaging your cable/satellite equipment. AC/Coax surge suppressor with Type "F" connectors are designed to protect all high-end video and audio equipment such as large screen TV'S, satellite equipment, DSS systems, VCR's, CD changers and stereo receivers.